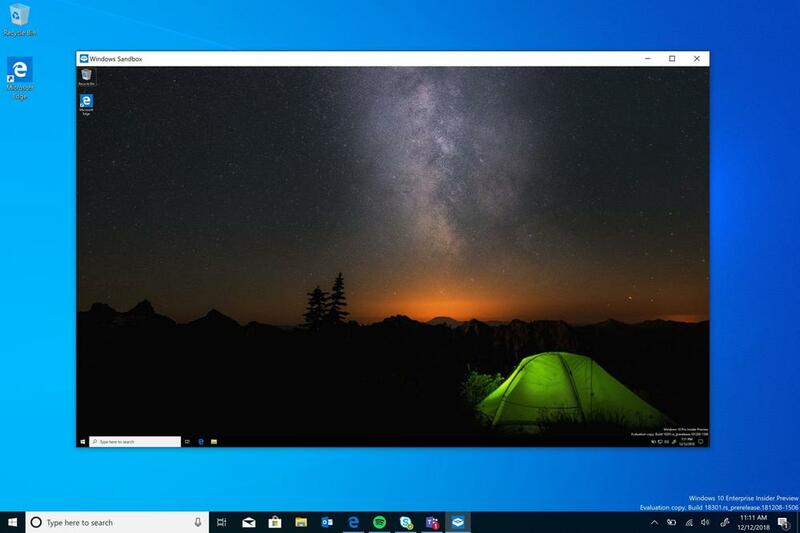 The next major version of Windows 10 is Windows 10 version 1903 (the April 2019 Update or 19H1); if things go as planned, it will be released in March/April of 2019. The new version of Windows 10 will be offered as a direct download and via Windows Update. Users need to actively seek for the update using Windows Update in the beginning, and it is only offered to certain computer configurations at first that Microsoft considers optimal. Insider Preview builds give us a clear picture of the changes and feature additions in the new Windows 10 feature update release. It will also be interesting to see if Microsoft manages to release a build that is more stable and less bug-ridden than the last feature update release Windows 10 version 1809. Microsoft had to pull the release shortly after release. The new version of Windows introduces a new storage concept called Reserved Storage. It reserves a certain amount of storage for the operating system for use by Windows updates, applications, temporary files and system caches. Reserved storage used about 7 Gigabytes of space on a test system with a 128 Gigabyte hard drive. 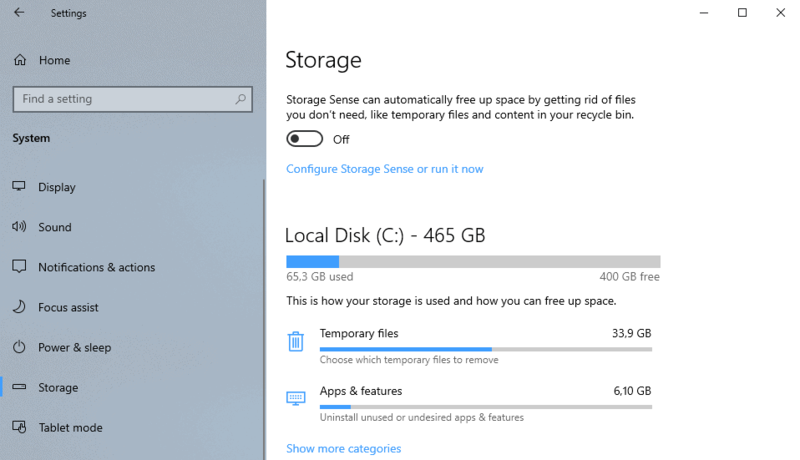 Windows users may notice a drop in free storage space thanks to reserved storage. Microsoft plans to turn on the feature only for new installations and for pre-installed systems. It is possible to enable Reserved Storage on systems that get upgraded to Windows 10 version 1903, however. 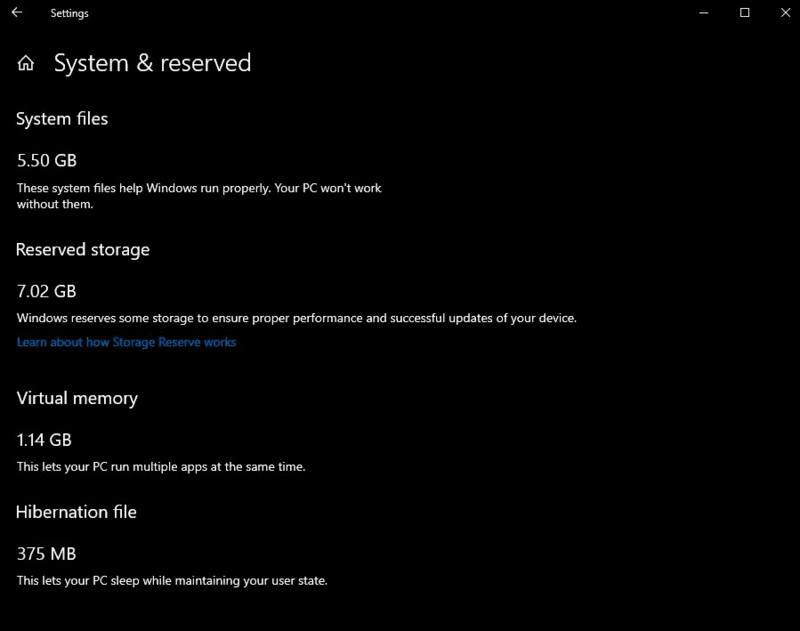 Windows 10 version 1903 features Storage improvements. When you open the Storage settings in Settings > System > Storage, you will immediately see how optimization options. Windows may display how much storage you may free up by cleaning temporary files or by removing applications or features. There is also a new "Optimize Drives" option which launches a defragmentation management window. Windows Sandbox is a new security feature that Microsoft plans to introduce in Windows 10 version 1903. It works similarly to third-party sandboxing solutions and uses Microsoft Hypervisor and hardware virtualization at its core. The sandbox requires Windows 10 Pro or Enterprise. You may use it to run any executable file to block it from interacting with the underlying operating system. In other words: what happens in Windows Sandbox stays in Windows Sandbox. Sandbox was launched with a basic set of features but has been improved in recent Insider builds. One new feature that Microsoft added was support for configuration files to control certain Sandbox features. Windows Sandbox is ideal for testing applications and for privacy / security purposes. Command Prompt and PowerShell text zooming support. Just use Ctrl-Mousewheel to zoom in or out. Zooming changes the size of the console window and makes text larger or smaller in the process. Cortana and Search go separate ways. You find a search bar and a Cortana button on the Windows taskbar in the new Windows 10 release. Extension: new Chrome extension for Timeline, Chrome and Firefox Windows Defender Application Guard extension. File Explorer may display file dates using a conversational format. You can turn this on or off. File Explorer supports options to access Linux files in a WSL distro from Windows. Focus Assist may block apps from showing notifications in full screen mode. Fonts may be installed using drag and drop in Settings > Personalization > Fonts. Office app is included in this release by default. Protection History is new in Windows Security. Recommended Troubleshooting section under Home > Update & Security > Troubleshoot designed to fix certain issues automatically. Registry Editor: press F4 to jump to the end of the address line and get a list of dropdown suggestions. Reset This PC: improvements to the user interface. Retpoline patch to improve performance of Spectre mitigations is enabled by default. Search features a new Top Apps section that lists regularly used apps (and is pretty useless in my opinion). Search locations (those that Windows indexes) can now be managed from the Settings app. Check Settings > Search > Searching Windows. Sign-in option to sign-in without a password using a (linked) phone number. Swiftkey, a technology to improve the touch keyboard experience, is now available for more languages. Start Menu uses a slimmer design with just one color of application tiles (instead of two). Start Menu option to unpin an entire group from Start. System apps: it is possible to uninstall more system apps using built-in functionality (and not PowerShell magic or third-party apps to do so). Task Manager displays scaling info. Also, legacy program scaling is turned on by default and you may set a default Tab in Task Manager. Troubleshooting: Windows 10 version 1903 may remove installed updates automatically as a last resort to fix non-booting PCs. Windows 10 Active Hours may adjust automatically based on usage. See Settings > Update & Security > Change active hours. Also, other Windows Update changes. Windows 10 Home admins may pause updates now. Windows 10 version 1903 supports the RAW image file format by default. Means: file explorer displays RAW image thumbnails and may use metadata of RAW files. Windows Mixed Reality: run desktop (win32) apps. Windows (light) theme in Themes. You may install it by going to Settings > Personalization > Themes. Your Phone app may support screen mirroring in the new release. Now You: What is your take on these improvements and changes? Microsoft Windows 10 control system spy navigation with extensions navigators firefox ¿? Extension: new Chrome and Firefox extension for Timeline, Chrome and Firefox Windows Defender Application Guard extension. Incredible situation windows control space systems never change to linux ! Never change to linux ! Have they removed or modified the options to defer feature updates upto 365 days and quality updates uo to 30 days that pro users currently have? If they do that, I am moving over to Linux. Yes. Defer only up to 90 days. No SAC/T anymore. Nothing in these new “features” is interesting or worth the upgrade from 1803. I have a feeling that the sign in option passwordless sign in via mobile phone would become mandatory. For starters how in the hell would I be able to log in to my computer without a smartphone? Let alone being able to create a windows account without a damn device. It seems to me that we’re being divided up into different classes, those without smartphone/iPhones and those who have them. Personally I would still use a password and a pin to log into my computer, long as I am able. If Microsoft decides to make it mandatory, then I am out of luck. Going passwordless would leave some of us out out in the cold and locked out of our damn computers. I am stuck with pay as you go service, of which the mobile network available in my area doesn’t have premium SMS, only standard SMS text. Most online companies are starting to use premium sms text. It’s going to be a major headache for me. Granted that Microsoft probably have other things covered, such as bio-metrics, pin number. But the downsides of using your phone as a main authentification method for a PC would still remain. Lose a phone you’re screwed, phone bricks on you, you’re screwed. Cell tower too far, you’re screwed. No, it won’t become mandatory because the feature does not make M$ extra money. It’s just a fancy sign-in option to make Win 10 1903 fancier than 1809 = an excuse for M$ to put out a new Version upgrade every 6 months. After Jan 2020 – the EOL of Win 7, M$ will likely make subscriptions for Win 10 Home & Pro & Ent mandatory because this new “feature” will definitely make M$ a lot of money. Win 10 will become Win 365, ala Office 365.? After Jan 2020, it seems that Microsoft will go with a subscription model. I don’t know where they will head. I have no urge to upgrade from windows 8.1. the basic MO of any company is to milk the customer much as they can. The idea of using a smartphone/iPhone to log in to one’s computer is a dumbest thing that Microsoft thought of. Microsoft should be concentrating on fixing the OS and release upgrades every two years, less chance of bricking laptops and desktop computers. Rather than dumping upgrades every 6 months. Microsoft will milk money from windows 7 users. Windows 7 and 8.1 are stable OSes, windows 10 is a twitchy operating system that acts like a snitch and peeping tom. No way Windows will be making passwordless mandatory. By the time they do that, companies will be dropping off Windows hard. The idea is not stupid either, Steam, Google, your local banks, and other services have already been doing this long before Windows. It’s just a trade of security for convenience. A bit nitpicky, why are you separating smartphones from iPhones? Are iPhones not smartphones? Last thing, you don’t need to use smartphone to receive SMS, any mobile phone can do that. Those aren’t even the worst of the downsides, in my opinion. The worst is how insecure the method is — reasonably determined attackers can intercept SMS messages for a given number for a limited time period, ensuring that they get the code, not you. I would not personally recommend or use SMS as part of any authentication scheme. The problem is not everyone has a smartphone/iPhone, let alone a feature phone. People still rely on landline and VOIP phones. Even a two hundred dollar mobile device is a luxury item, and accidents are costly. People live check by check, and Major carriers squeeze their customers with hidden fees. Even though prepaid mobile network carriers don’t have premium SMS text. The idea of everyone carrying mobile phone is stupid. And no two prepaid mobile network carriers are alike. The idea of using a mobile device to authenticate and log in to one’s computer is the dumbest idea every..!!! It’s a friggin nightmare. For example. I had to set my mobile to receive verification code via voice messages from my bank before doing online business. Granted that a bank can send verification to one’s land line/VOIP, via the same old voice message. Yes, that’s another problem — although in the US anyway, you can buy a prepaid cell phone with a small amount of minutes and texts included, for about $10. But I don’t think it’s safe for anyone to be using SMS for this purpose even if they do have a phone, because of serious security issues it brings. It’s just another shot at getting your phone number. They want to add it to the data package they have on you to increase it’s value. Remember, you are no longer the customer, you are now the product. WinSandbox is a welcome addition. Windows 10 – the operatingsystem that is the easiest one to hack – from online…. New first-party extensions for Timeline? Where was this confirmed? I didn’t see anyone else mention this. Ah, cheers. I misread “new” for Firefox, too. Thank you for the clarification. Running Windows or a Linux distro using 16MB of VRAM on Linux feels smooth and fluid while running any OS on VirtualBox, using 256mb of VRAM is laggy AF. …which is made by Oracle, not part of Microsoft. Perhaps the problem is VirtualBox. you can try thincast solution based on virtualbox and implemented it on directx emulated layer between windows host and windows guest. It all seems rather pointless. And considering that most updates destroy about 10% of all systems it’s not worth the effort. Can we have an only do updates older than 6 months old feature? I’m on board with calling Microsoft out on the terrible quality control they have for Windows, but I don’t think that most updates have adversely affected 10% of all systems, let alone destroyed them. I think it’s generally been 1 or 2 percent (which is still a really large number of people). If you have data otherwise, I’d love to see it. Thanks a lot for this very useful change list! Sandbox is cool but really not a lot of new features in these feature updates. I tried Windows 10 (it was installed on my new laptop) and I’m totally dissatisfied. Worst of all Windows I used more than two weeks. Compared to Windows 7 it’s a complete disaster one needs to fight daily. I see no improvements I’m really interested in. My interest is to get the system running fast apps I want, not to be bugged by the bloatware MS installs. To get that I need to turn as many Windows 10 services as I can, including the monstrous Windows Update. I think I have found a security problem in Windows 10 (1809) which I would like to report (or ask) Microsoft. However I don’t know how to send this message to MS, so I try it through this site. If I start the installable or portable version of LameXP, (a day later) I find that LameXP has managed to set itself as the preference program for audio playing and video playing (Default Programs). I did not set this myself. If I then click, in Default Programs, on one of the 2 LameXP-mentions, with the intention to change back to Foobar of VLC, there is no opening of the options, however Default Programs is shut down. If I reopen Default Programs, the 2 LameXP settings are still there. So the author of LameXP has succeeded in preventing Windows 10 to change the Default Programs settings, against the will of the user. So I think this is a hack of Windows 10. After uninstalling/removing LameXP the possibility to set the Default Programs for Audio and Video are back again. I think MS has to check what is going on. I hope this message goes to MS. And possibly an explanation can follow through this way. I don’t think this is a security problem. More like a PEBKAC, similar to users installing malware-ridden programs from untrusted websites or downloading virus-infected pirated stuffs from torrents. Users need to check out reviews of programs/software before installing them. However: if they restrict and mess with the feature update delaying options, it is going to be problem. A rather big one, I suspect. You can play with fire only a certain amount of times. Releasing buggy updates is one thing, forcing them onto users is like telling them to switch OS. Now You: Is MS actually pushing for that (OS switch) and why? Some of the things Micro$oft needs to fix are qa of patches/updates and removal of the bloatware such as xbox, games, etc. or come up with a new version for gamers who want/desire such things. A funner idea would be to go back to Win 3.1 with updated processing abilities. In relation to the subscription idea I think we will see it and we will be going back to the dumb terminal hosting idea (see chromebooks) as this would save them money and time from pushing out updates to the users, though it would impact the storage industry. Them (M$, FB, Twitter (fbi/cia/nsa), and others) collecting info on us is not really different then what they do in China (social credits), its just a different means to the same end. A Cellphone has GPS so they can track your location better. A couple of things I do like in the update is the RAW picture support and more ability to remove system apps.